Both curtainside and sliding bow (roll-top) trailers are designed to expand your freight options in a single adaptable trailer. Both open up the bed of a standard flatbed to new profit opportunities that extend far beyond the conventional flatbed’s potential. And, perhaps best of all, curtainsiders and sliding bow trailers eliminate the time-consuming, hazardous requirement to tarp large loads—a perk that also makes it easier to recruit and retain professional drivers in an era of high turnover. What's The Difference Between a Curtain Side Trailer and Sliding Bows? A curtainside trailer consists of a solid, fixed bulkhead up front, fixed swinging or roll-up rear doors and a hard-shell roof overhead. Both sides are a retractable, heavy-duty curtains instead of solid walls like a conventional trailer. 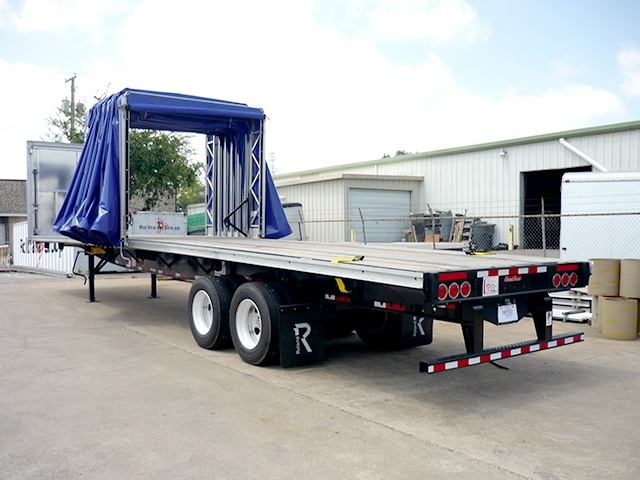 The curtainside configuration is typically constructed on either a standard flatbed trailer or a step-deck model. A sliding bow trailer resembles a curtainside, except with a soft roof and movable rear bulkhead mounted on sliding bow supports in a track. When slid forward or to the rear, the entire unit compresses somewhat like a concertina. The soft, flexible sides and soft roof can be moved all the way forward, compressing against the front bulkhead, or all the way to the rear. This flexibility opens the entire bed to rapid loading from both sides or above. Once the load is strapped, the sliding structure is returned to its original position, totally enclosing the load and eliminating the need for tarping. Rapid two-side loading/unloading at facilities without a standard loading dock or where ground access by forklifts is faster. Accommodates large flatbed-style freight that can only be side-loaded and is not appropriate for a conventional enclosed van. No more time-consuming tarping on flatbed-style loads. Just load from either side, strap down and close the curtains or slide the bow structure closed. No injury potential to drivers and more time moving down the road instead of tarping. Provides access to all freight at any time—just retract the curtain or slid the bows forward or backward—accommodating multiple partial shipments in one trailer. Because back-to-front freight sequencing is eliminated, curtainsides and sliding bows permit addition of haulbacks for additional revenue while still preserving access to pending deliveries anywhere on the trailer. Shippers of certain large specialized freight often prohibit any contact with tarps—for example, large machinery with milled surfaces, robotics, and aircraft and aerospace components. These shipments make flatbed transport unfeasible and a curtainside or sliding bow is the only option. 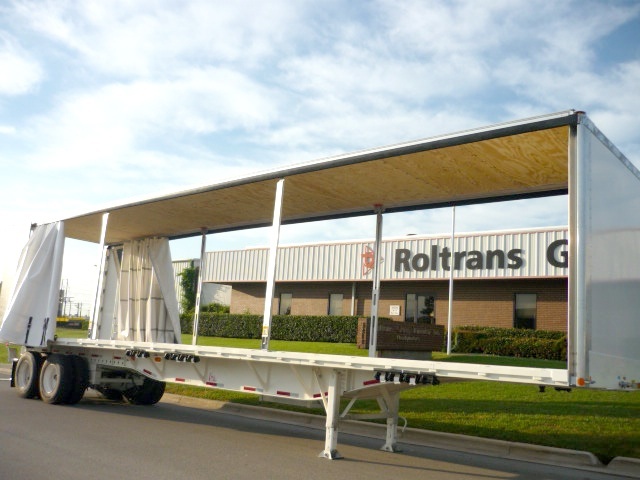 Curtainside trailers incorporate advantages specific to certain freight requirements. These include a hard shell roof for greater security and protection of freight in the event of a rollover. Translucent roof panels also illuminate the interior of the trailer for safer loading without additional lighting. Dual swing or roll-up doors in the back allow conventional back-in dock loading. The sliding bow option, conversely, offers an extra dimension of access not provided by a curtainside: The soft retractable roof opens up the entire bed to crane loading from above. For large freight that can’t be side-loaded into a curtainside, or loaded through rear doors into a conventional van, only a sliding bow can fully eliminate the need for an open flatbed trailer. How Do I Purchase a Curtainside Trailer Conversion Package?